So if you’re ready to start being bolder with your gemstones, to go overboard with your opulence, then we’re here to help you out. 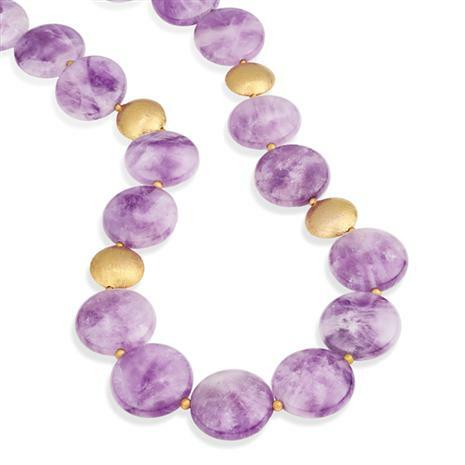 The Wilde Amethyst Necklace is 18 powerfully purple amethyst stones, seductively strung on a gold-finished necklace. But it’s not just the number of stones that matters— it’s the size. These amethyst stones weigh a titanic total of 580 carats, so that when you adorn yourself with the Wilde Amethyst Necklace, you’re wearing an abundance of affluence, a glut of grandeur, a surfeit of splendor, a lavish level of luxury. The one area where we disagree with Mr. Wilde is money. In Wilde’s era, jewelry was priced to make it the preserve of the upper classes. Even today, too many stores want to make jewelry unattainable by adding extra zeros. But we’ve made it our mission to give more people access to excess, and so we’ve brought the price of the 580-carat Wilde Amethyst Necklace down. Going Wilde has never been so affordable.